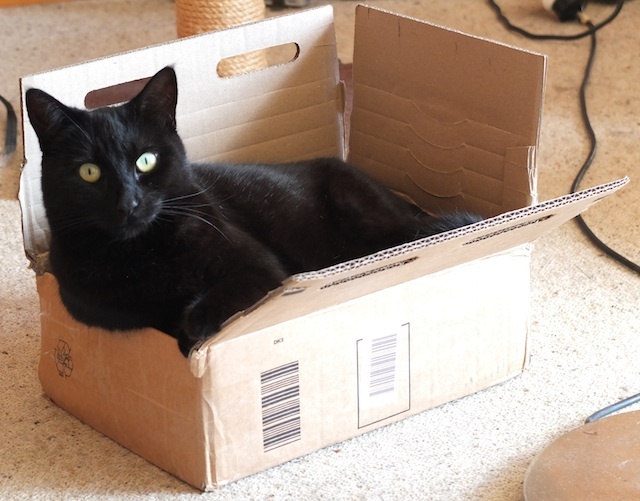 Sciblogs | Books, boxes and cats – are eBooks reducing community access to university library material? 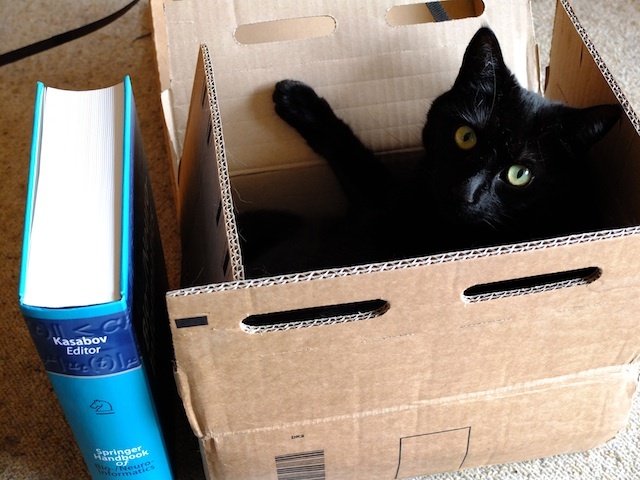 Books, boxes and cats – are eBooks reducing community access to university library material? 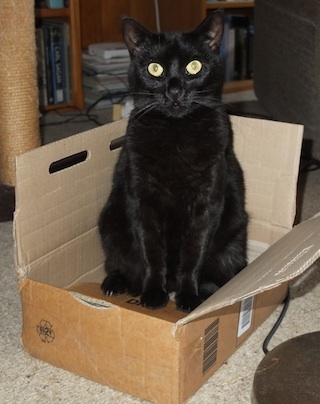 Aimee, the cat, didn’t come with the book. It’s massive tome, over 1200 pages. A print copy will cost something fierce, I’ve no doubt. Electronic copies of each chapter can be purchased too. You’ll know that credit card advertisement where the packaging the valuable item came in was ‘priceless’. That box is like that. Months later it’s still Aimee’s place to be. She’s folded down one side, using it as a headrest. Hours on end are spent there doing not much at all. But I’m not writing to tell you about Aimee and the new bed the publisher sent. Visiting the local university library over the past few years I have witnessed a loss of public access of research material. Many textbooks at the university library are now only available as on-line copies. Access to these is limited to staff or students of the university. Similarly, library access to many research journals is on-line only. One role of university libraries is to provide a resource for all local residents, not just university staff and students. Members of the public can get a university library card and take out bound editions of books on the shelves or make copies of research papers available in print form. But they can’t access the electronic copies. The licenses of the electronic copies are limited to those within the institution. Is the burgeoning market for electronic books and journals cutting those outside of universities off from research material? One solution is open-access editions. However, as much as these have appeal, we should accept that some will remain ‘pay-walled’ – at least for a few years to come. Increasingly there are scientific research journals whose contents are open-access – once the research is published, anyone can read them and download articles from the internet. Textbooks seem more problematic, however. Like printed books, their business model may more naturally fit being paid for by the reader. Is a solution needed so that textbooks might be read with the local geographic region, not limited to institution staff or students? Or are those not directly affiliated to the universities going to be increasingly cut off from research textbooks? 1. Part B, Chapter 8, Exploring the Interactions and Structural Properties of Genomes by Grant Jacobs, in Springer Handbook of Bio-/Neuro-Informatics, 2014. Editor: Nikola Kasabov. Publisher: Springer-Verlag. ISBN 978-3-642-30573-3 (eISBN 978-3-642-30574-0). I imagine it is the same in New Zealand. I had wanted to locate and cite the relevant law here, but was so tired last night I couldn’t face the idea of tracking it down. It seems to me that it could potentially evolve into quite a large break of one of university’s roles unless it is tackled somehow. Is this right? Otago and Canterbury were not crated by central government, they were st up by the then provincial governments and I have no idea what the roles were seen to be when they were set up. Martin looks to be writing about Australian universities (“here in .au”). I discussed this with the librarian at my work. The thought was that citizens/public may have access to e-resources via a public access terminal. At least some university libraries have this setup. As always, the advice is: ask your librarian. Fair call, Maurice. Do you think it’s a realistic, practical solution though? In my article I wrote “take out bound editions of books on the shelves or make copies of research papers available in print form”. People not directly affiliated to the institution seem only to be able to read at the terminal. For journal papers there might be a loophole of sorts via interloan (ILL). That’s supposed to be to other libraries, but I suppose you could join the local public library, then interloan the paper to get a personal copy. You’d have to pay for it, of course and it would a bit of a rigmarole simply to get a personal copy! It feels like travelling backwards to something similar to many years ago after my undergraduate studies when I visited the university library at nights to draw up my research proposal for my applications to study for my Ph.D. overseas. * I notice that they don’t name researchers in other institutions or organisations. No I don’t. I agree access is a problem. Over the years I have made use of academic library usage facilities both professionally and personally. Currently i do have institutional access and I am concerned that when I become an independent researcher I will have minimal access. Google scholar and open source journals are helpful but under current publishing rules we have reason for concern. My librarian’s view was that this is an issue and that the balance of holdings would be set by usage. As expected cost is a huge constraint.. I don’t blame the libraries – cost is a big issue for them; they seem a bit damned both ways. Open source journals are a huge help, but there is a still a large chunk of good literature that is pay-walled. Textbooks seem harder to call. Also for textbooks, I was thinking of more than ‘just’ the people who read the primary literature. University libraries hold more specialised books that a public library can justifiably hold, so either you’d need need pockets or hope that enough remains in a form you can get a hold of. Pity I didn’t find this while I was writing my post, but there it is for any readers coming late to this! He touches on the issue of business model & funding, too, as well as peer review and who gains from this approach. It’s an unfortunate situation. E-books and journals becoming available should make access even easier for the public. However, the publishers and licence holders are the ones blocking this. Libraries nearly always have their hands tied. I work for a massive academic library. We recently worked on a project to make some 500,000 eBooks available to all patrons (public) from any location. Previously, they had to be at a computer with a university IP address. The hurdles that had to be jumped through were absurd. Libraries remain at the mercy of horrendous fees for journals and books, despite the increased quantity of open access material. Until academics collectively chose to publish open access instead of in journals which they have elevated to such high status, prices will remain extortionate. But what are the chances of that happening – the H-value and citation counts of these academics seems to remain the most important factor to many.